US, UK, and France introduce Security Council resolution condemning Syrian chemical weapons attack. 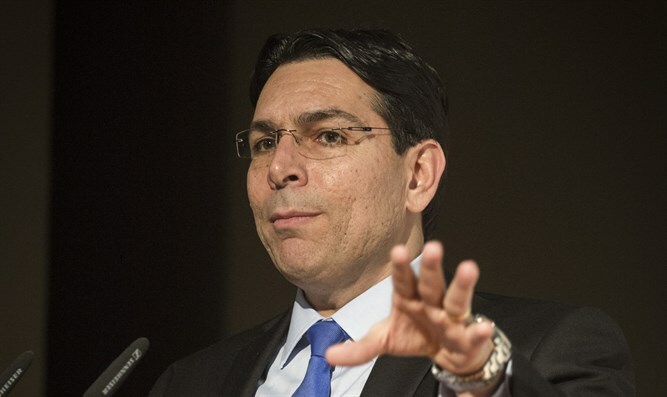 Israel's Ambassador to the United Nations Danny Danon strongly condemned the chemical weapons attack in Syria’s Idlib province on Tuesday, as a result of which roughly 100 people were reported killed and hundreds more injured. He called on the UN Security Council to “use all its authority to put an end to the situation in Syria." "The world must not remain silent in the face of crimes against humanity. The international community should act immediately to stop the ongoing massacre of civilians," he said. Danon’s statements came as the US, Britain and France on Tuesday proposed a United Nations Security Council resolution to condemn the attack, which the countries blamed on Syrian President Bashar al-Assad’s forces. According to Reuters, the draft of the Resolution calls on the Syrian government to provide an international investigation with information about flight plans around the time of the attack, helicopter squadron commanders, and air bases believed to be linked to chemical attacks. It "expresses its outrage that individuals continue to be killed and injured by chemical weapons in the Syrian Arab Republic, and expresses its determination that those responsible must be held accountable." Diplomats said that the resolution would likely be put to a vote on Wednesday.